Here's a nice still of the cast of Stagecoach lining up in full costume for a United Artists publicity shot around the time of the film's release. Claire Trevor, John Wayne and Andy Devine on the left look relaxed enough but some of their co-stars seem oddly reluctant to break character. "I don't know what the government is coming to. Instead of protecting businessmen, it pokes its nose into business! Why, they're even talking now about having bank examiners. As if we bankers don't know how to run our own banks! Why, at home I have a letter from a popinjay official saying they were going to inspect my books. I have a slogan that should be emblazoned on every newspaper in this country: America for the Americans! The government must not interfere with business! Reduce taxes! Our national debt is something shocking. Over one billion dollars a year! What this country needs is a businessman for president!" One can't help feeling that there are as many Gatehouse's alive and well in America today as there were in 1880 or in the Depression-haunted thirties when this speech was written. This sort of detail makes Stagecoach feels like an oddly left-wing film for John Ford to have made: news of the Republican Convention even gets dropped entirely from the Lordsburg newspaper's front page in favour of a splash on the Ringo Kid's Main Street stand-off with Luke Plummer. 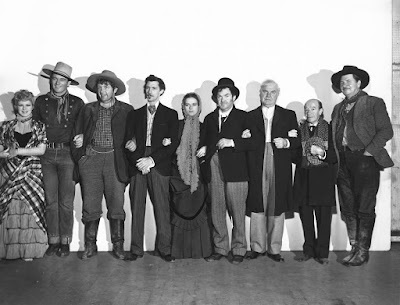 Scripted by Dudley Nichols and Ben Hecht from a 1937 Collier's story by Ernest Haycox, Stagecoach is packed with brilliant character performances throughout from the likes of genre stalwarts Wayne, Thomas Mitchell and Devine but special mention should really go to several others. Trevor is tremendously moving as Dallas, the film's tart-with-a-heart and the object of Ringo's affections, John Carradine does well in expanding upon an otherwise one-dimensional goateed Southern gambler part and Donald Meek is on hysterical form as the quivering whisky salesman Samuel Peacock/Hancock. Meek's double act with the perpetually sozzled Mitchell as philosopher and sometime medic Doc Josiah Boone is a joy, especially when the latter is tucking his friend carefully into his seat in order to silence objection as he sets about draining the man's entire sample case. Meek is also funny donning a deerstalker hat in terror as soon as the possibility of Apache scalpings is mentioned. The stunts are astonishingly impressive too and all the better for being real rather than CGI concoctions, most notably the river crossing and climactic chase across the plains under attack from Geronimo's braves. As for the Winchester-wielding Wayne, well, as soon as Ford's camera zooms in on his youthful face you know you're looking at a legend in the making.